I’m really not on a mission to stamp out Grammar Naziism. It’s a cause unworthy of that kind of devotion. But I came across an article today that bothered me just enough to provoke this post. Impact is a noun, not a verb. A plane can crash on impact. You can have an impact on something. But you cannot impact something. She of course offers no support for this position. We are simply to take her word for it. But in just seconds Google demonstrates that every popular online dictionary lists a legitimate verb use of impact. That includes at least Merriam-Webster, MacMillan, American Heritage, Dictionary.com, and The Free Dictionary. Of those, Merriam-Webster lists the verb form first. American Heritage and The Free Dictionary both include usage notes pointing out that lexical panelists strongly disapprove of the verb use of impact, but both editors express bewilderment at the animosity aroused by this word and point to the long history of impact as a verb. No word research would be complete without referencing the grandaddy of them all — the Oxford English Dictionary. And the OED aligns with the others, pointing out that impact has been used as a verb in print since at least the early 1600s. In fact — check this out — it was a verb before it was a noun. That’s the key to understanding the problem people have with it, I think. They mistakenly assume that it’s an example of verbification. In fact, I assumed the same thing until I did some actual research. And people often object to verbification, especially in the corporate world or when it creates ugly or unnecessary words (like disincentivize, solutioning, or anonymize). But this isn’t the case with impact, which, according to American Heritage, was used as a verb for more than a hundred years before the noun usage emerged in the late 1700s. But even if it were the other way around, there’s no cause for objection. All kinds of common verbs today are converted nouns, including mail, sleep, stop, and mutter. No one is concerned about those. Why pick on impact? Maybe we’ll never know. The truth is, I tend to prefer other words to impact — affect and influence usually seem like better options to me. But I suspect I’ve just subconsciously absorbed the pervasive anti-impact bias among grammar geeks. I may start using it more often just to fight my prejudice. Did this post impact you in some way? Please let me know in the Reply section below. Take the Subject-Verb Agreement, Part 3 Quiz! I am an opponent of “impact” as a verb and will be forever. I appreciate your position and it is interesting to know that impact was a verb before it was a noun. Even the late, great William Safire finally accepted it, chiefly because it was NOT a “verbification” of a pre-existing noun, as so many other horrid examples are. I would be happy to never again see “author” as a verb, for example, although I know I’m losing on that one, too. did this post impact me? i tensed when i heard the question, but i’m realizing it’s not the verb itself that bothers me, it’s that because it’s a verb it gets overused. that’s why i pick on impact. people get used to a certain phrase and then stop thinking about it. really most of the time there are much better alternatives. impact is a very evocative word, it brings to mind violence, and suddenness, so, no, your blog did not impact me. it did have an effect on me. i’ve been thinking about why it makes us so indignant to see people misuse language, and i’ve been trying to be more forgiving, because language is there to communicate not to follow rules. it’s not everyone’s top priority. and why articles with typos seem to lose their credibility for me. again, it’s important to overlook some things, and let language evolve. i like the way you express your gentle acceptance. in fact, thoughtlessness is my biggest irritant. i should probably ease up on that too. I cringe at the over-use of the word impact – noun or otherwise. Everything is impact today. I’ve heard a high level manager state that this new policy will by “highly impactful” – what the…?. I almost lost it then. You hear Peter Mansbridge and every journalist on TV, radio and cbc.ca use impact(ing) as noun or verb. Whatever happened to effect, affect, result, implications, etc. The word impact is a slam dunk word that sounds more dramatic – you almost want to put it in italics, bold, and quotations followed by an exclamation point. Gee whiz. While I’m at it, the other nasty grammatical problem I see (well one of many actually) is the use of qualifier words or more precisely, quantifier words, as if a number, say five hundred, becomes “hundreds and hundreds and hundreds”. “Very, very much”, “millions and millions of whatever”, “really, really good”, all of which are redundant and fill space with useless words that add nothing. Some highly excitable people glad to be alive and being interviewed seem to get really exuberant with this and take to the next level adding an extra third qualifier so that “tall building” becomes a “really, really, really tall building”. Granted language is picked up and most don’t realize and/or care how they use it. What bothers me is our national broadcaster CBC, (BBC, CNN, and others are guilty too) lowering its own standards instead of consciously maintaining certain higher level of standards. Precise and concise use of language is a beautiful thing to hear and read. The best speakers and writers use English (in this case) masterfully with minimal words and clear simple sentences devoid of excitable phrases that the masses have latched on to. It’s sad to see the demise of the clever use of language. Thank you. One of my pet hates. Impact being used as a verb without the preposition. It is an intransitive verb and there for must impact on the situation, or affect the situation. You wouldn’t say something affects on you, so don’t say it impacts you. Such ugliness must be resisted. If impact is a noun then it’s noun. Don’t you have anything better to do? Who are you talking to, Lorrie? 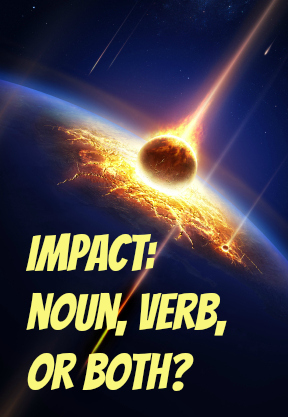 I’ve just shown you that “impact” can be either a noun or a verb–like many words. Who said anything about arrogance? Who said anything about consequence? But apparently your rudeness and arrogance is a consequence of your loneliness. Get a life. If you don’t like reading this blog, go elsewhere. It’s not arrogance at all. It’s like using consequence as a verb. Nobody uses consequence as a verb. And who said anything about arrogance? I adore this post. And find some of the readers’ comments interesting and others’ irksome. I’ve been guilty of finding new language conventions irritating, especially related to how language has changed relative to social media. But the reality is that language is a living entity and, as such, it changes. A little bit of irritation is the price I’m willing to pay for language to continue to be dynamic. Personally, I’ve always liked “impact” as a verb and find it no coincidence that I have no friends who consider it objectionable. I was happy to hear about the old history of its use as a verb. Thanks for the research and the very interesting post! I’ve been around business since the early seventies and remember hearing impact as a verb meaning affect at least in the early eighties. It always struck me as incorrect and my ear didn’t like it. Impact as a verb meaning to strike is to my mind the only traditional verb form. The usage “ideas or notions impacted on the mind” strikes me as a bit odd, unless it a figurative usage akin to “striking on the mind”. One would never substitute “ideas or notions affected on the mind” as it makes no sense, hence the comparison is off the mark. All said, though, it seems the usage is here to stay, the language is fluid, and I’ve come to generally accept it rather than to hopelessly rail against usage that seems to have caught on. In medicine, we use the adjective form: impacted, as in “impacted stool,” etc. But the word does mean “ideas or notions impacted on the mind,” in addition to “strike.” English is my third language, and that meaning doesn’t strike me as odd. The problem has never been verb vs. noun. It’s always been about meaning. “Impact” does not mean “affect” (or “effect,” for that matter). It means forceful contact (noun) or to come into forceful contact (verb). If something impacts you, that means it hits you physically, not that it affects you. Of course, it could be used figuratively, but you still have to know what it means when employing that. On a related note, that the modern dictionaries contain certain usages is fine and dandy, but that’s because they are descriptive not normative; they’ll put almost anything in a dictionary these days. I was trying to make the argument with a friend, that affected would’ve been used to better effect. But my friend didn’t understand the difference between affect and effect. This news program uses impacted exclusively. What ever happened to mixing it up a little? Use impact now or then. Use affect occasionally to keep your writing fresh. I’ve since stopped watching the channel. I wonder if one reason people are using impact so often is to avoid the confusion between affect and effect? Thank you for this post. This objection to impact as a verb has peeved me for decades, but without the knowledge that there is considerable historical precedent to justify verbification. And for me it is the continued objections in the face of clear justification I find most irksome. I, too, was told in grade school by most teachers never to use impact as a verb at all, and by other teachers to use impact only when describing a physical impact. The alternatives provided to me were to use “affect” or “influence”. The problem with these alternatives is the connotation. The words themselves lack impact! (They are relatively weak without modifiers). I can affect or influence other people or the world around us by things I do, but this does not leave one with a feeling that reality was significantly altered. On the other hand, if my actions impacted the outcome of some process, there is a sense that the outcome may have been altered significantly, even drastically. There is no other verb I can think of that imparts this meaning as well as impact. It is this obvious lack of alternatives and quiet acceptance of “affect” and “influence” as preferable options that I find most compelling. Paul, your objection to “affect” or “influence” as being “relatively weak without modifiers” applies just as well to “impact.” In your own example, “if my actions impacted the outcome of some process, there is a sense that the outcome may have been altered significantly,” well – did you make it better or worse? Did you grease the wheels or stonewall? The real problem with “impact” is as you say of the other words; whether noun or verb, without modification it’s unclear. Use of a word that requires modification for clarity, when clearer freestanding alternatives exist, is just sloppy writing. Thank you for this interesting analysis. The word “impacted” has a clinical use to describe a person who is extremely constipated. So when I read about something being impacted it is not the most eloquent visualization. It’s turned into silly business speak along the lines of incentivize for incentify or the silly “prior to” instead of “before.” Even though it is indeed a verb you are quite right that there are better choices of alternate words. Thanks for the historical information about the use of impact. Until relatively recently, I never hear impact used as a verb. When used as a verb it sounds like a dental or gastrointestinal problem. He was impacted for years by medical problems. The new health care law impacted millions of Americans. Putin is impacted by sanctions. Laxatives anyone? What’s even worse than “impact” as a verb is the barbaric usage of “impactful”. Causes for us usage Nazis. I don’t find it in the least barbaric. I think your reference to dictionaries as authority for the proposition that the first use of “impact” was the verb form is, while commendable, imprecise and misleading. The verb form usage in the 1600s is the usage that bothers no-one. It is the more traditional and still-current verb usage (e.g., “impacted stool”). Clearly, with reference to both the definitions and the examples, the word’s verb history was different from the current use as a synonym for “affect.” Do you have evidence to support the proposition that this latter use is not a result of verbification? early 17th century (as a verb in the sense ‘press closely, fix firmly’): from Latin impact- ‘driven in’, from the verb impingere (see impinge). You make a good point, Kim. The earliest uses of impact were as a verb, but the definition of the original differs somewhat from the verb that bothers folks today. The earliest published use of impact meaning “to come forcibly into contact with” is 1929 (1916 if you count the participle form). And the definition “to have an effect on” is more recent still — 1935. The definitions are semantically related, but you are right: they are not the same. Impact, like many words, has evolved in meaning and usage over time. I guess you could argue that this latter use is, after all, a type of verbification, but there’s just as much evidence that the noun it came from was derived from the original verb. I guess that means it was “nounified” before it was “verbified”? I’ll concede, upon further review, that impact (meaning affect) is likely a verbification. This doesn’t change my view overall, however. It’s been around at least 79 years, and has been steadily growing in print appearances. Even as a verbification, it’s fine. It’s just one of many ways words enter the lexicon. As I wrote, I don’t prefer it in the “affect” sense, but neither does it bother me when others use it. Thanks for the intelligent comment. Though not intentional, my post is a bit misleading. My argument stands, I think, but it’s not as airtight as I make it seem. Though not intentional, my post is a bit misleading. dangling modifier. Your post was not unintentional (or unintended). You are correct, Angela. A bit obnoxious, but correct. I’ll refrain from correcting the errors in your comment, however. Kim, I think I love you. Thank you for the breath of fresh air that your logical & accurate post provided. Impact used to be used only in the physical sense, “the moon was impacted by a meteor” or something like that. Using “impact” as a verb in an abstract sense only came about some time in the nineties, being derived from business and marketing English. Unfortunately a whole generation of people has grown up believing that saying something like “that impacted me greatly” is actually correct. Even many news anchors in the U.S. are no longer aware that it is not correct usage. It is sad when we let bad business English seep into the language, but nowadays using “impact” instead of “affect” seems here to stay. Peter, what is your source for the statement “Using ‘impact’ as a verb in an abstract sense only came about some time in the nineties…”? The common complaint from grammar purists is, “‘Impact’ is a noun, not a verb.” That was the idea I debunked in this article. You are now making a more qualified argument — that it’s okay to use it as a verb if you mean in the physical, literal sense, but not in a non-physical, figurative sense. I fail to see any basis for such a claim. 1) Your assertion that this non-physical usage “came about some time in the nineties” is contradicted by the OED, and as you offer no evidence for your claim, I can’t accept it as authoritative. 2) Even if your assertion were correct, there is no reason to dismiss a new coinage simply because it emerged recently or because it emerged out of the world of business and marketing. 3) There is nothing uncommon or incorrect about using verbs in a figurative sense. Nothing is more common in English. Would you suggest the following uses are wrong? It strikes me as odd. Even if your argument had any credibility, I fail to see why it is in any sense “unfortunate” that a word take on a slightly different meaning in popular usage. What does seem unfortunate, however, is when intelligent, well-meaning people take it upon themselves to judge the correctness of popular English usage. You have every right to your opinion, of course, and if you think “affect” is preferable to “impact,” then by all means avoid that kind of usage in your spoken and written communication. But neither your preferences nor mine, nor even the preferences of scholars and experts, define what is correct speech. “Ideas or notions impacted on the mind” absolutely is in the physical sense. It’s figuratively physical. That’s an odd-sounding notion, but it’s the case here. It’s not equivalent to saying, “Ideas or notions impacted the mind,” which is a clear misuse of “impact” instead of “affect.” The use of “on” makes all the difference here. I was responding to a comment that suggested that “impact” was used “in a physical sense” as opposed to “an abstract sense” until “some time in the nineties.” That is a demonstrably false statement. The point isn’t “physical” or “not physical.” It is literal or figurative, and you have stated that “impacted on the mind” is figurative, which is my point. “Figuratively physical” is clearly not the same as “literally physical.” You’re just playing with words. I’d love to hear how you distinguish the meanings of “impacted the mind” from “impacted on the mind.” The only grammatical difference is that the first uses “impact” as a transitive verb and the latter as intransitive. The meaning is virtually identical as far as I can tell. On what authority do you declare “Ideas or notions impacted the mind” “a clear misuse of ‘impact'”? A Google search brought up 313,000 responses to the phrase “impact the mind” and 305,000 to “impacted the mind.” Seems a pretty common use of the word. As I’ve said, if you don’t like it, don’t use it. Your article really impacted my understanding of this word. Hopefully, I will transition to using impact as a verb in the future. “Of the eight issues the author addresses, I have no objections to three of them, three are oversimplified and therefore misleading, and three are just plain wrong.” In the math I learned, three plus three plus three equals nine. Does one of them duplicate categories? Leave a Reply to Lorrie Click here to cancel reply.